I made this greeting card for my sister. She loves cats, and breeds Bengal cats as a hobby (quite successfully; she has had many show winners). There was a lot of prep work for this drawing, a lot of sketching and preplanning. I also set myself a serious deadline, and had to make choices in order to make the deadline. It was stressful, but I’m glad I did it. The card was drawn on a big sheet of paper in Pentel red line pencil, and I inked the letters using a Faber-Castell PITT artists brush pen. I didn’t have time to ink the rest analog, so I decided to do the contour lines in Sketchbook Pro on the Mac. I haven’t done any work with that app, so it was good to experience what it felt like to use. 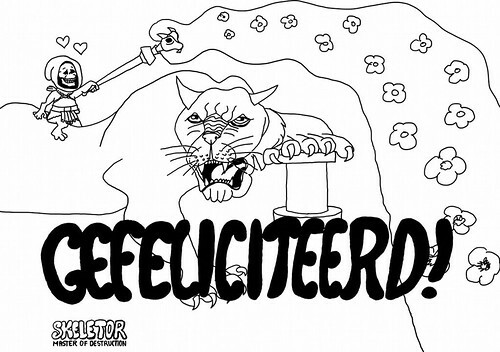 I did the digital drawing on the morning of my sister’s birthday, so there was no time to do any coloring. Even for self-assignments there are three things to choose from: quality, time and price. You can only pick two. Here that was time and price. Quality had to suffer a bit. Good to know for a next time. While everyone is expecting a tablet PC from Apple called “Slate”, in reality Apple has been working in total secrecy on a sleigh, called “Sleigh”. 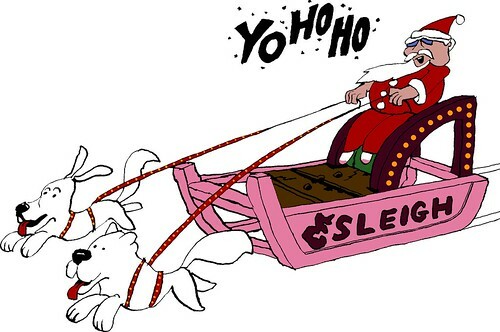 Here is an artist’s impression of a leaked pre-release version of Apple Sleigh. The dogs aren’t real dogs, but robot-powered iDogs. This drawing is made to support the sale of the collected trade comic book of PC Weenies, a webcomic by Krishna Sadasivam for Geeks and people who can tolerate them. 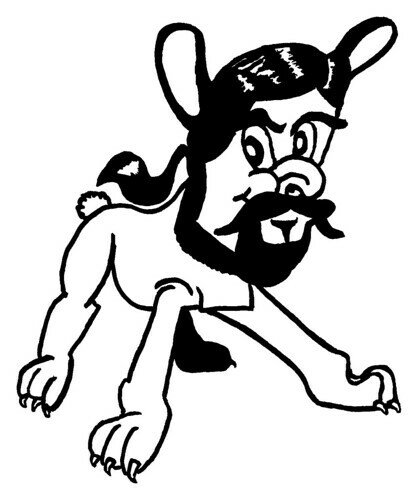 Krishna grows a beard in response to a challenge from his fellow comics creators, while he doesn’t like a beard. Read more about it, and how you can support the artist in this post on his blog. For each copy of the trade comic book “Rebootus Maximus” sold through the website Krishna won’t shave for a day. Let him look like a hobo and freak out his wife, who is on family visit for a few months in India. 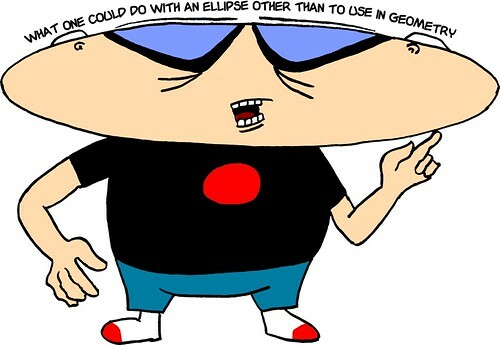 What one could do with an ellipse other than to use in geometry. This fan art is made to support the sale of the trade paper back comic book of the web comic PC Weenies. The comic book is called Rebootus Maximus. The creator of Rebootus Maximus, Krishna Sadasivam, has a small experiment going on, where he will grow a beard for as many days as there are copies of the comic book sold through his website. He called this dare Beardus Maximus, and it is the challenge I’m supporting whole-heartedly by drawing a piece of fan art, either with Bob Weiner in it, or something that has to do with beards (or both). BTW I used the ellipse construction technique I wrote about earlier today to construct Bob Weiner’s head shape. As promised some weeks ago, here is Mark Rudolph drawn as Dogmatix. The process involved massive sketching (until almost all the paper was filled with pencil lead), erasing with kneaded rubber, inking with a brush pen, scanning, threshold filter, and some creative retouch. The sketching was the hardest to do, because I had to draw in the style of Dogmatix, while putting features of Mark in it. I used Mark’s drawing on the “Don’t Draw Like My Buddy” mug and an image I –ahem– got from the Interwebs of Dogmatix as templates and kept sketching until the result did both justice (in my opinion). It is hard to explain, because it all happened in the “back of the brain”. Obviously, I have had enough drawing practice in the last few weeks so, that I was able to pull this off. It’s still crude, though, and would need several months of refinement to approach something what I would call “professional looking”. 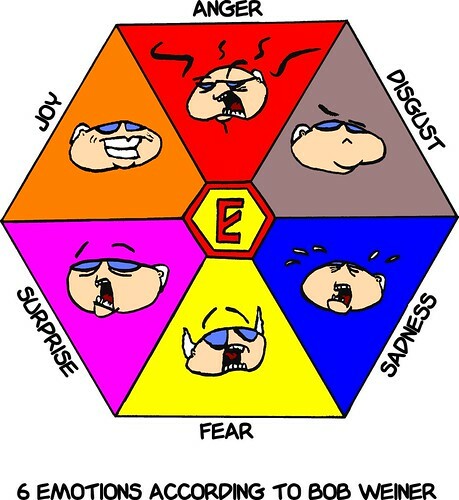 The idea behind this piece of fan art was to find expressions of Bob in the comic book that illustrate the six recognized basic emotions in comics (and art), from which all other emotions spring. So what it came down to was mostly an exercise in search, and then trying to reproduce the face of Bob Weiner as closely as in the comic art. I’m not too sure about the surprise and the disgust, though. It was the closest to the basic emotion as I could find them, browsing through Rebootus Maximus. The colors were a bit of a puzzle too. Anger (red), sadness (blue) and fear (yellow) were easy, but what colors represent joy, surprise and disgust? Well, orange seemed to fit joy, and the other two colors (purple for surprise and brownish mauve for disgust) I found through Google search. This fan art is made to help sell the trade paper back comic book Rebootus Maximus and to support the artist in his quest to grow a beard for as long as the comic book is sold through the website (see Beardus Maximus on PC Weenies). I wondered what Bob Weiner would look like if he were a car. This fan art is made to help sell an excellent comic book, published as a collected trade of the web comic PC Weenies by Krishna Sadasivam. The comic book is called Rebootus Maximus. 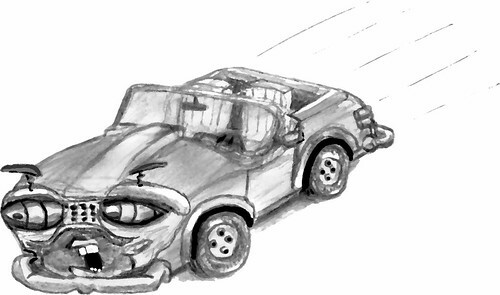 As I’m not that good at drawing cars yet, you might think that I used some tricks to create this image. And you would be right. After giving enough contrast to the image with Levels and drawing with white and black, I used the paint artistic filter of GIMP to give it a painterly look and feel. It disguises many of the little mistakes I made. I started sketching and sketching with a pencil and this form popped up. It wasn’t planned. Just some sloppy drawing. Afterwards I’ve inked, scanned and cleaned it up a bit. Next I colored it in GIMP. Not very anatomically correct, but a lot of fun to do.